An anonymous comment, which cannot be published due to its language, remarks that I must have a sad life, my report was rubbish and it achieved nothing. Have a happy day, Anonymous. 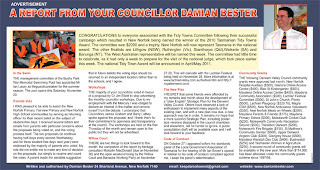 I'd like to add my congratulations to your efforts in keeping us up to date with what's happening - we hear absolutely nothing from any of our other elected councillors - including the Mayor whose well-paid job I believe should be keeping the electorate fuly informed. Keep up the good work Cr Bester, you have many many supporters.